How to download videos from Mixergy interviews, courses and save to any format you like? Batch download video or audio from Mixergy, Youtube, Lynda, Udemy, Pluralsight, Digital Tutors, Linux Academy, etc. Is there any way to download video from mixergy.com to save a local copy? If you would like to save some Mixergy interviews or courses for offline viewing, you may have discovered it is easy to copy and print the text, but not the video or audio. How to save Mixergy video or audio for viewing on your PC or smart phones, tablets? The following guide will show you a powerful Mixergy Video Downloader - Bigasoft Video Downloader Pro and step by step guide on how to download media from Mixergy. How to download video or audio from mixergy.com on Mac or Windows? 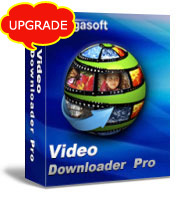 Firstly, free download Bigasoft Video Downloader Pro. There are two different versions for Windows and Mac users separately. Both versions cover all the operation system at present. Batch download and save video/audio from Mixergy to MP4, AVI, MOV, MKV, VOB, MPEG-2, FLV, WTV, MP3, M4A, WMA, WAV, etc. More than 300 formats are supported. 1000+ sites are supported. Easy to download media from Mixergy as well as YouTube, Linux Academy, Lynda, Coursera, Udemy, Pluralsight, Digital Tutors and more. Save Mixergy Interviews and courses for playback with iTunes, QuickTime, Windows Media Player or iPad, iPhone, Samsung, HTC, other smart phones, tablets and TVs. Copy the URL of the Mixergy video or audio which you want to download from the address box of your browser, then paste it to the text box on the left side of Paste URL button. Actually, as soon as you mouse over the download panel, the URL will be pasted automatically. Click "Save Folder" button to choose the destination folder for the downloaded Mixergy media. If you prefer to save the downloaded video or audio to other formats, like VOB, FLV, WMA or M4A, please be sure that the "Automatically Convert to" option is checked, and then click the drop-down button on the right side of the "Automatically Convert to" to select your desired format. Most popular media formats are supported. With Bigasoft Video Downloader Pro, you will be able to view the downloaded Mixergy video, audio on any player or any media device. One-click to download Mixergy videos. From Activity panel, you can check the downloading process. After a few minutes, the Mixergy media will be downloaded and converted to destination path. Download Bigasoft Video Downloader Pro and enjoy Mixergy interviews and courses anytime and anywhere.